According to a recent report, a 10 kilowatt-peak (kWp) floating solar farm was commissioned on Laguna Lake within Baras, Rizal province. This intended to supply the town with clean and free energy. The project is the first floating solar farm in the Philippines, thereby opening the possibility of using energy from the sun beyond the traditional ground-based and rooftop-mounted systems. 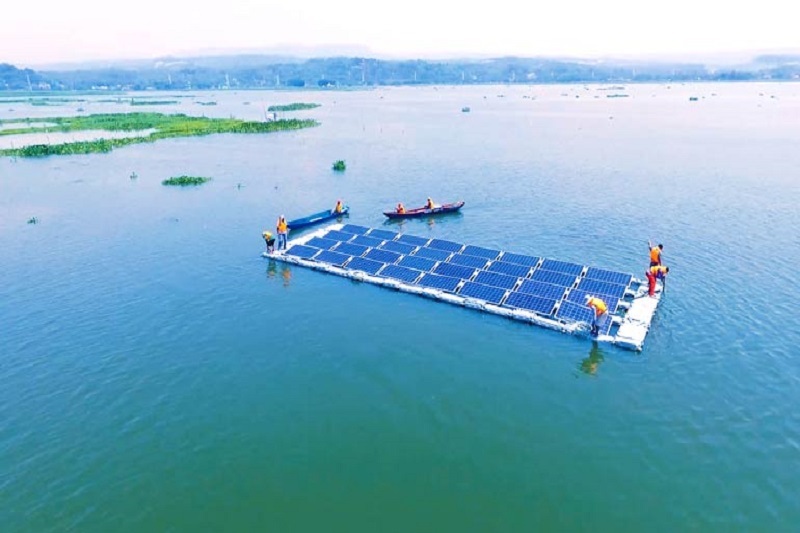 The sustainable energy firm that launched it aims to show the technical feasibility of floating solar technology in the country. The technology involves deploying solar photovoltaic panels on the surface of a body of water. The technology has been deployed in many other countries, such as Japan, China and the United States. The 10kWP project is designed to last for 25 years. A connecting station was also built, allowing residents to use the power generated for charging gadgets, powering sound systems, and lighting up the river. One of the advantages of floating solar farms over ground-mounted solar facilities is that no farm or forest lands are used. No trees are required to be cut. Moreover, floating solar farms also mitigate water evaporation and the proliferation of algae in the lake, and may help aquatic and marine life to flourish. The project also has the potential to improve the community and boost local tourism and economy. Floating solar farms are more technically efficient than ground-mounted projects because the cooling effect of the surrounding water on the panels makes the panels produce more energy. The pilot project would provide free renewable energy to the municipality of Baras. The solar farm is equipped with a battery storage system that ensures a sustainable power flow. The pilot also forms part and paves the way for the development of a much larger and commercially-viable project, also being executed by the sustainable energy firm. As an archipelago with inland and offshore bodies of water, the Philippines has a huge potential for floating solar farms. This technology could also make use of lakes created by abandoned open-pit mining by deploying solar panels on top of it. Prior to the commissioning of the solar farm, a tripartite memorandum of agreement was signed by the company, together with the town and the Laguna Lake Development Authority (LLDA), on 14 August 2018 for the pilot project. The mission of the Laguna Lake Development Authority is to manage, develop and transform the Laguna de Bay Region into a vibrant economic zone through conservation of lake basin resources and good governance with the participation of empowered and responsible stakeholders. In 1993, through Executive Order 149, the administrative supervision over the Agency was transferred from the Office of the President to the Department of Environment and Natural Resources (DENR).